Ragweed is a flowering plant in the aster family, a very large family which includes asters, daisies and sunflowers. There are seventeen different species of ragweed in the United States. There are annual varieties as well as perennial herbs and shrubs. Some species may be just a few inches tall while others may be over ten feet. The stems may be erect or may grow along the ground. The leaves may grow opposite each other or alternate on the stem…or they may do both. The leaves come in many shapes: they may have a center vein or the veins may radiate out like fingers on a hand, the edge of the leaves may be smooth or toothed. Some leaves are hairy. It would be a gross oversight to discuss ragweed without mentioning allergies. It has been estimated that 50-75% of all cases of pollen-related allergies in North America are caused by ragweed. The technical term for an allergic reaction to pollen is “allergic rhinitis” but most people refer to the problem as “hay fever.” Despite its name, hay fever does not mean that people are allergic to hay or that they have a fever ‑ hay is rarely an allergen, and hay fever does not cause an elevated temperature. Like all allergies, ragweed allergy occurs when the body’s immune system reacts to a foreign substance that is actually harmless ‑ in this case, pollen released by maturing ragweed flowers. Those not allergic to ragweed pollen are not affected or aware of the pollen. For those who are allergic to ragweed pollen there is little that can be done to avoid it. Ragweed is found throughout the country. Allergy sufferers used to move to high altitudes or desert areas to avoid high pollen levels but ragweed has spread even to many of those former retreats. “The reality is that there is not a corner of the country where there is no ragweed pollen,” says Christine B. Franzese, MD, assistant professor of otolaryngology at the University of Mississippi Medical Center. A single ragweed plant produces up to one billion pollen grains and the pollen can remain airborne for days and travel great distances. 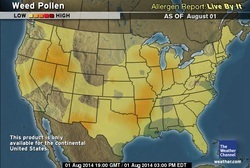 Ragweed pollen has been found in air as far as 400 miles out to sea and up to two miles high in the atmosphere. There is no cure for ragweed allergy. The best control is to avoid contact with the pollen as much as possible but even surgical masks are ineffective at keeping pollen out of a person’s airway. One thing that might help is knowing when and the pollen is lowest. Pollen counts are highest during the daytime, from dawn to and 3 p.m., depending on the weather. Rain and morning temperatures below 50° F slow down pollen release. The best defense could be to stay inside. Central air conditioning with a good filtering system will keep pollen out of the home. A more drastic measure may be to travel to an area where the pollen count is lower. Antihistamines help to control symptoms. 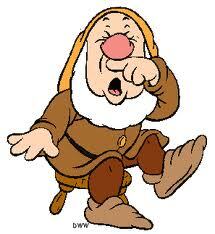 If that is insufficient relief immunotherapy (“allergy shots”) may help once the specific allergy has been diagnosed. Ironically, unlike many weeds such as the dandelion, mullein and creeping Charlie, ragweed is native to America and was introduced to Europe. It was first found in Europe during the nineteenth century but the spread of ragweed increased greatly during World War I, and even more so since the 1950s. Unfortunately, ragweed is continuing to increase in Eastern Europe. Perennial plants and healthy turf inhibit the growth of ragweed but since the break up of the Soviet Union and the abandonment of the collective agricultural system in the early 1990s, there has been a lot of uncultivated agricultural land. In addition, new building projects have resulted in disturbed soil and ragweed has increased. Like many weeds, seeds in the soil will grow when conditions are right even after many decades of being dormant. I am thankful that I don't have allergies but I have friends whose quality of life is significantly altered because of pollen. I'm not bothered by ragweed, but I wouldn't mind having it eradicated. I don't see any redeeming feature to it. Some people say the ragweed plant is a good source of food and cover for wildlife such as rabbits and grasshoppers. I'm sorry, but that really doesn't help the argument. I love rabbits as a pet but I have a dog to chase wild rabbits away from my garden. I am also excited that my chickens eat grasshoppers -- they are interesting bugs, but extremely destructive. There are other creatures animals that eat ragweed seeds. Specifically mentioned are voles and cowbirds, as well as a variety of other birds: junco, bobwhite, purple finch, mourning dove, goldfinch, and red-bellied woodpecker. I would love to feed my voles something more lethal and cowbirds are like the mafia. The last thing I'd want to do is foster a weed that feeds destructive animals and causes many people allergy problems. I'll put out birdseed and suet and pull all the ragweed I can.